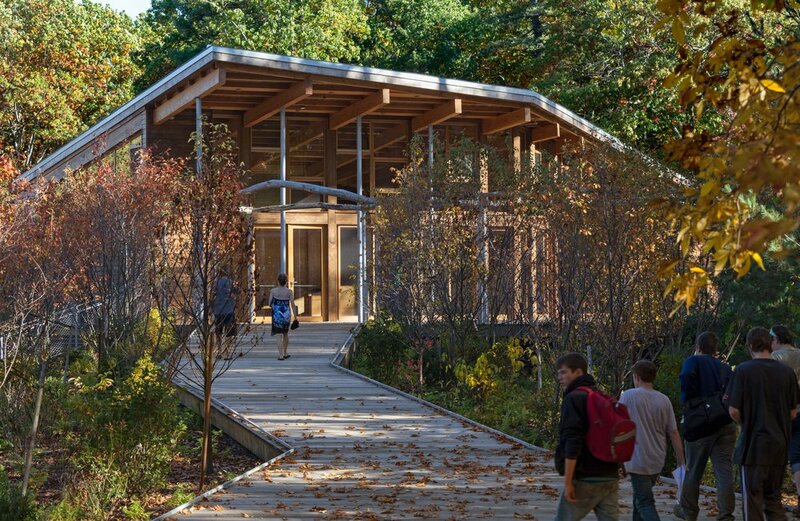 Walden Pond Visitor Center — The Green Engineer, Inc.
Walden Pond State Reservation is an internationally acclaimed National Historic Landmark and protected open space along 330 acres. Over 500,000 visitors a year visit the pond due to its great beauty, as well as the inspiration of Henry David Thoreau, who authored "Walden Pond". The surrounding towns of Concord and Lincoln are the fonts of the flowering of American literature in the mid-nineteenth century, as well as the birthplace of the modern conservation movement. 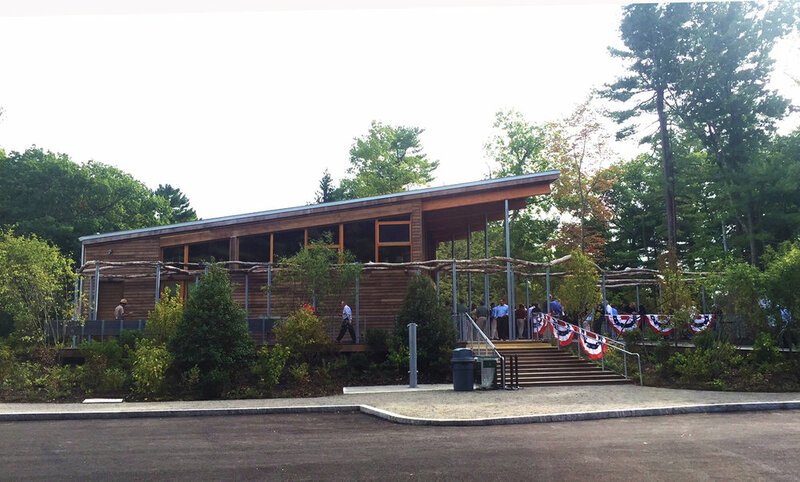 The Walden Pond Visitor Center was the result of a decades-long planning and implementation process, and the fruition of an in-depth collaboration between the DCR, and the design team and stakeholders, including the Walden Woods Project and The Thoreau Society. Local context and site conditions informed the design strategy and implementation at all levels. The 6,000 sf visitor center designed by Maryann Thompson Architects interweaves with the landscape in order to emphasize the pond and heighten the experience of the site. The building is nestled behind trees and shrubs giving it an air of mystery with a long accessible ramp to draw visitors into the visitor center. Exhibition spaces, a community meeting room and staff offices, create a new hub. A large open-air deck of locally-sourced, heat treated ash with a black locust trellis, addresses the pond and provides a moment of repose at the building’s entry. Heat-treating wood is excellent for outdoor applications, and prevents the use of scarce rainforest woods such as Ipe. The project also used a portion of the former visitor center foundation, as part of an ethos of salvaging and saving. The office millwork was done in Massachusetts Red Oak harvested by DCR’s forestry team specifically for the Visitor Center. The building structure is an all-electric, net-zero energy consumption building and implements Passive House principles. The building has no reliance on fossil fuels. In winter, high-performing triple-pane windows and super insulation keep the heat inside. In warmer weather, ample operable windows, ceiling fans and clerestories create natural ventilation and light, reducing the need for air conditioning and artificial lighting. 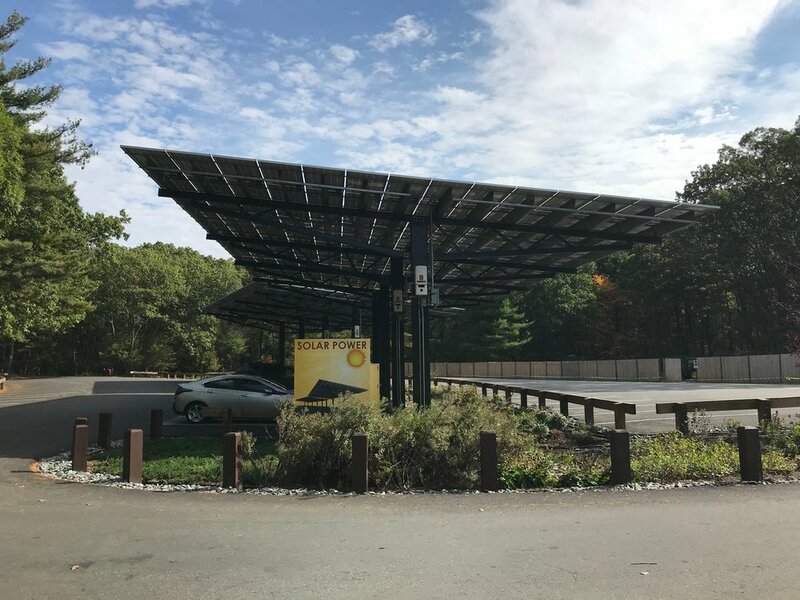 A 105-kW photovoltaic solar canopy provides shade over the parking lot and services all the energy needs of the building and state reservation. An electric charging station allows visitors to charge vehicles. The walls and floors of the building are from locally-sourced heat-treated maple, ash and red oak to withstand the New England weather. Framing and sheathing materials are FSC certified. Water efficient plumbing fixtures and low/no-VOC paints and finishes were used throughout. The Visitor Center’s design has focused on reducing energy use compared to a baseline building by incorporating south-facing orientation to facilitate solar heat gain and use of natural light; super insulation to conserve heat through increased roof, wall and window insulation values; automatically controlled 0.6 watt/sf LED lighting systems; a 4.5 kW solar hot water heating system, and a Variable Refrigerant Flow heat pump system. Building systems are anticipated to reduce energy consumption by 48% plus savings from the PV array and solar hot water heating system. Interpretive displays educate the public about the building energy saving features and its net zero energy use. Visitors to the Center also have an interactive sense of the ecological building principles, which are contemporary expressions of the legacy of Henry David Thoreau and the American Conservation Movement. The project is a LEED-NC v3 Gold certified, Net Zero Energy Building.